If you are looking for the hottest jobs in the hottest markets in the nation, you will have to go south. According to the latest issue of Business 2.0, 14 out of 15 fast growing job markets in US are located in the southern states, with Florida hosting 5 of them. Among the hottest jobs, IT project manager, Senior software developer, and Construction project manager are the most needed as they are popular in 11 of the 15 markets. 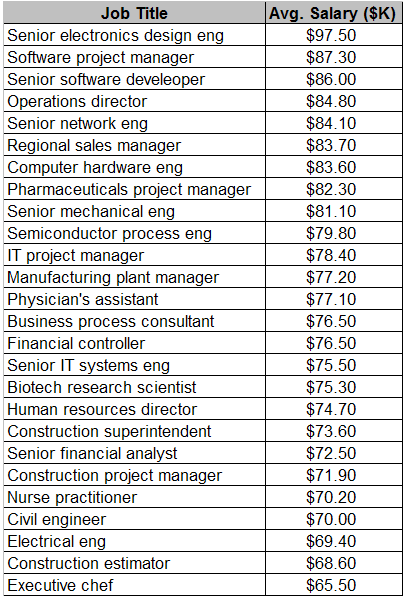 The average salaries for all the job titles in the report are listed below. Clearly, IT related jobs are still paying good salary as 9 in the list are either hardware or software jobs. What surprises me, however, is that Physician’s assistant is also a high-paying job now, competing with software developers and IT managers for the top spots. Considering the national shortage of nurses, it does seem to be a natual result though. Do You Have A Hot Job?